Bibliographic data, part 3: Has anyone, anywhere, ever read the whole of the RDA specification? I only meant to write two articles on the difficulty of representing a journal article reference in a standard XML format. But an epilogue is warranted because, well, surely there has to be a standard way to do this. Well, let’s step back a bit from the detail of XML representation. Let’s just look at cataloguing rules. My job is the subfield of programming that relates to searching, retrieval and metadata, especially as it relates to libraries. That means that what I deal with is mostly bibliographic metadata — sets of fields that describe book or journal articles. For example, the federated search system that we provide, while not in any way limited to searching for and presenting results of this kind, has tended to be used primary in the library domain, so I spend a lot of my time dealing with bibliographic data. It’s a jungle out there. The dominant electronic format for bibliographic information is, still, by far, the ancient and faintly comical MARC (MAchine Readable Catalog) format, or rather, the MARC family of similar but subtly incompatible formats. 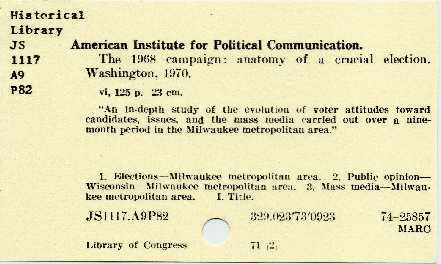 MARC originated in the 1960s at the Library of Congress, literally as a way to encode the information on physical catalogue cards.